Having written about Slovak traditions for years now, I figured it is about time I spread the love for my own country a little bit. There is no better moment to kick this initiative off than today. Because today is a special day in the Netherlands. Today is the birthday of His Royal Highness, our King Willem-Alexander of Orange-Nassau. This in itself may not inspire you to leap of joy immediately. 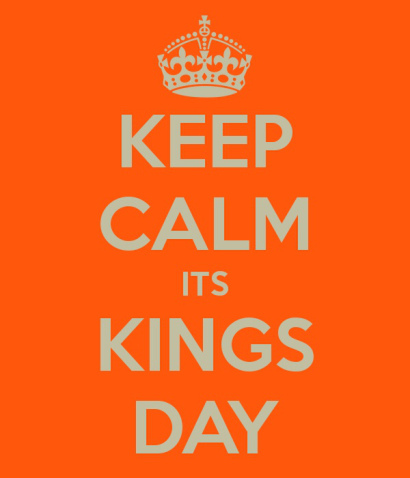 What makes this day special to the majority of the Netherlands, however, is that this means we will celebrate King’s Day. And boy, is that a party! First some necessary background, for the uninitiated. King’s Day started as Princess Day on 31 August 1885, the fifth birthday of Princess Wilhelmina (the great-grandmother of our current King). When Wilhelmina became Queen in 1890, Princess Day changed to Queen’s Day in 1891. Until 1948, it was celebrated on 31 August. In 1949, it was changed to 30 April, in celebration of the birthday of Juliana, King Willem Alexander’s grandmother and Queen of the Netherlands after Wilhelmina until 1980. During the reign of Queen Beatrix from 1980 till 2013, the date to celebrate Queen’s Day remained unchanged, this time to celebrate not her birthday but the date she ascended the throne (30 April 1980). Queen’s Day was however finally moved to April 27 when Willem-Alexander took to the throne in 2013, it being his own day of birth, and for obvious reasons changed in name to King’s Day. Originally, Queen’s Day was considered a children’s feast but quickly it became a feast for the entire nation. The magnitude of this celebratory day is hard to imagine for people outside of the Netherlands, but let me tell you: it is huge! The whole country is coloured orange, there are big music festivals in most of the major cities, people party since the night before (Koningsnacht, or King’s Night), royalists toast to the King’s health, and Republicans conveniently seem to forget they don’t like the royal house for once. King’s Day is one of the very few moments in the year when the Dutch people stop being individuals and show solidarity and unity. For a moment, we are all about collectivism instead of individualism. For one day, the nation is possessed by the “Orange Craze” – we sport the orange colour, we party, we drink, we play weird traditional games (just look up “spijkerpoepen” and “koekhappen” and you understand what I mean), we randomly shout “Long live the King” on the streets, and we scavenge the traditional flee markets for crap we never knew we needed. One day in the year we stand united under the orange banner. As one nation. As one people. That is the beauty of King’s Day…and of course the parties. I mean…let’s not kid ourselves. I know many people in the Netherlands object to maintaining a royal house on the grounds of it being “not of this time” and a burden on the Dutch taxpayers. While I agree with the last part, I fully disagree with the first. This ancient institution is what gives a character to the Netherlands that distinguishes us from other countries, not in terms of importance but in terms of stability and continuity. Where so many European countries have cut ties with their royalty, The Netherlands has remained true to its roots since they were planted in the 16th century. The royal family and their predecessors helped build our country centuries ago and helped shape it to what it is today. In a country divided by countless ridiculous debates that see traditions and cultural values disappear like snowflakes in the sun, we need an ancient institution like our royal house to remind us where we came from and who we are. We are a kingdom and we should be proud of that. King’s Day (and Queen’s Day before that) is to me an amazing way to celebrate that history. If you don’t party for the King then at least party for your country. Older PostSpring arrived in Bratislava!